PRE ORDER THE DOUBLE A SIDE SINGLE ‘NO FOOL / ON A BLUE DAY BY FAIT ACCOMPLI ONLINE AT BANDCAMP. Download comes with special limited edition 4 panel gatefold CD with front and back cover art. 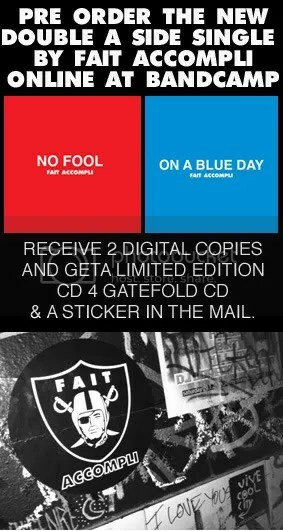 NO FOOL red / front and ON A BLUE DAY blue / back and brand new Fait Accompli logo sticker. Includes immediate download of 2-track album in your choice of 320k mp3, FLAC, or just about any other format you could possibly desire.